Laurel (STEVE COOGAN) and Hardy (JOHN C. REILLY) — the world’s greatest comedy team — face an uncertain future as their golden era of Hollywood films remains long behind them. Diminished by age, the duo set out to reconnect with their adoring fans by touring variety halls in Britain in 1953. The shows become an instant hit, but Stan and Ollie can’t quite shake the past as long-buried tension and Hardy’s failing health start to threaten their precious partnership. This release comes with a slip cover. 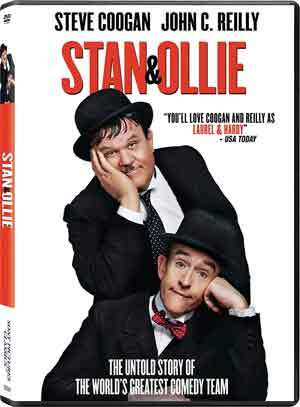 Features include four featurettes — Making Stan & Ollie, Playful Prosthetics, The Dancing Duo and a Cast & Crew Q&A — and three Deleted Scenes. The movie is presented with a 16×9 enhanced 2.39 widescreen aspect ratio and comes with a standard but fine Dolby Digital 5.1 track. Overall, Stan & Ollie is a nice little biographical drama-comedy with good performances from its leads, Steve Coogan and John C. Reilly. The DVD includes some good bonus material while the video/audio transfers are standard for the format.